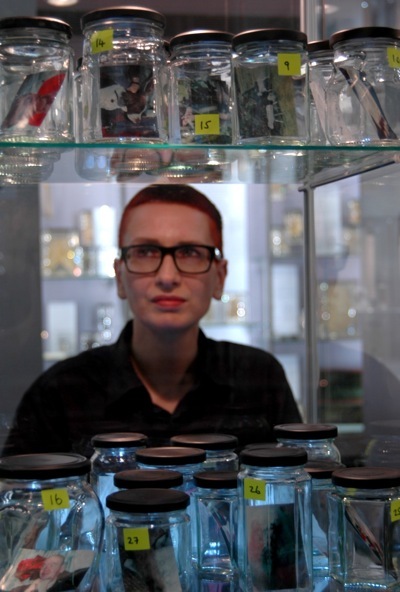 This is the online catalogue for my Memory Jar Collection, installed in the Hunterian Museum's Crystal Gallery at the Royal College of Surgeons in London between September 2011 and January 2012 during my Abnormal exhibition at the museum's Qvist Gallery. The Crystal Gallery displays the remaining 3,000 items from the 18th-century surgeon John Hunter's collection (the majority, a further 12,000, were lost when a bomb hit the museum during the Second World War). The collection consists of human and animal body parts, displayed in specimen jars. Nothing is now known about the animals and people that the specimens come from, although a number of the human body parts came from Hunter's patients. Hunter's collection has been enormously valuable in helping us to understand the human body, but also represents the way in which the body has been fragmented and anonymised within modern medicine and human identity lost. I have always been interested in collectors, and studied them as part of my PhD in Communications and Image Studies. My Memory Jar Collection consists of photographs of animal and human body parts, still attached to the bodies that they come from - in viewing them, you may also catch echoes of the individuals who contributed their body parts (willingly or not) to Hunter's collection. Most of the photographs were taken during 2010/11 as I created my collection, but the memories attached to them often go back far into my past. The photographs have been printed out on a mobile Pogo polaroid printer*, and put into individual numbered preserving jars. Here, you can find out more about the bodies pictured, thus preserving the identity of the subjects and some of the memories that I attach to them. Both human and digital memory soon degrades - one day, this website may provide the only clue that I have myself to the content of this work. Having experienced memory problems in the past after I was ill in 2000, I know only too well how fleeting memories can be, and that before I die, this may be the only way I can access my own memories. While some people still believe that part of their soul is captured when a photograph is taken, the subjects of photographs often soon become unidentifiable too. Digital photography is even more ephemeral than traditional photographs, since the majority of images are never printed. In the end, will our photographs preserve the identity of their subject any better than Hunter's collection of body parts does? * The Pogo printer was also used within the workshops that I ran during the Abnormal exhibition tour. Participants paired up and set up their own self-portrait, which their 'pair' captured using the camera on a mobile phone. The images were then printed out on the Pogo and used within montages where the participants further explored issues surrounding identity. This is the first self-portrait that I ever took, in April 1997. It shows me wearing a spinal brace, in order to treat the chronic back pain and spinal inflammation which developed following a spontaneous fracture in 1990. (I have an underlying spinal curvature, and previously experienced a spontaneous fracture in my right foot when I was 19. As with my spinal fracture, it went undiagnosed for long enough to leave lasting problems.) The brace had been decorated to enable me to wear it openly over my clothes instead of hiding it. I have written about this experience further in My Not-So-Secret Life as a Cyborg, which also includes other photographs of the brace and my spine. 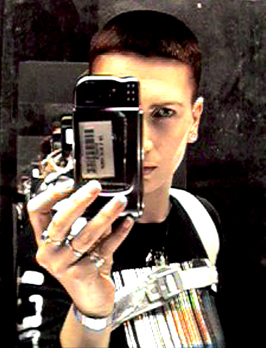 I took this photograph in April 1997, as part of the shoot for my website My Not-So-Secret Life as a Cyborg. 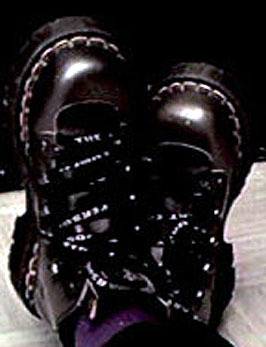 It shows my feet in the first pair of 'Art' boots that I had ever bought (I am now on my third pair). I often have problems with my feet, and after my spinal fracture I had to keep my right foot in tubigrip for about four years. However, as well as being fashionable these boots are orthopaedically sound - although they are also very heavy - and suit my feet very well. The fact that the boots have steel toecaps continues to be helpful even when I am using my power wheelchair. Non-wheelchair users would be surprised by how many times your feet can be hit during the day when they are out in front of you on footrests, not just by doors but also by other people crashing into the chair. "created by nature modified by life"? or a silverbooted moonmaid with starglint eyes? This image shows my friend Layla and I balancing against each other, with my hands on her feet. It comes from my film-dance Fight, made in 2001, which you can find out more about and watch here. I originally trained as a dancer, but stopped at 16 after my spinal curvature developed. I gave up all forms of dancing when I was 19, after I sustained a spontaneous fracture in my right foot. Any attempt to jump on it after that made it swell again and risked further damage. However, in my 30s I realised the extent to which dancing had contributed to my identity, and began some intermittent movement work again. This was my first professional piece, commissioned by the City Gallery, Leicester for exhibition within the Adorn, Equip touring exhibition. It has since been shown all over the world. I got Gif from the local cats' home - run by a disabled woman from her terraced house - in August 1997. I'd gone looking to rehouse an adult cat, after leaving my other cats behind in Cornwall with my ex-partner when I returned to London after completing my PhD. However, there were more than 90 kittens in the home and only three adult cats, so it made more sense to take a kitten. Gif was my dream kitten, being fluffy and grey with long fur - I had wanted a cat like that since falling in love with my sort-of-cousin Tricia's cat Smokey as a child. Gif was feral and had been captured in a garden with his five litter mates, three of whom had already died. Since I had had a feral cat before, the home asked me to take him straight back with me, although they warned me that he wouldn't eat for another 48 hours or so. However, as soon as I opened my lunchtime tin of soup, he started to purr and has never stopped purring since. He soon grew a magnificent set of whiskers too. I called him Gif after the file extension Graphic Interchange Format, but he soon became Mr Giffy, and Mr Giffy he remains to everyone except the vet (who calls him Mr Beautiful!). Giffy now rules over all of the other animals in the house, and always comes to see visitors to ensure that they know who is boss. Doris, like Mary Poppins, was 'practically perfect'. She was never ill, and even the day before she died the vet could find no sign of illness, although she was clearly unwell. She belonged to my partner, who always said that Doris's arrival had saved her from a major depression. When I first met Doris, I knew that, if she didn't like me, my new relationship was doomed. Doris fixed me with her eye, then started to purr. What a relief! Later Doris moved into my studio until my partner could be rehoused by her housing association. Doris always behaved, and was treated as, an honoured guest, but explained that she would still prefer to be with my partner, who had 'lovely things'. (Years later, when we were finally able to unpack my partner's possessions, this turned out to be absolutely true.) I also used to translate Doris's poetry: she liked haikus, but her favourite poem began 'Oh gravy, oh rich brown gravy ...'. Doris was an elegant cat, and as we heard the others scampering around with her upstairs, we knew that she was teaching them to dance. Had she been human, she would have been a ballet mistress. Doris was finally able to return to live with my partner for the last eight months before Doris died. My nephew has always been a happy-go-lucky boy, and this face characterises that (although in reality he is very goodlooking). His face was later jeopardised when he flew over the handles of a friend's bike, and smashed his teeth. My sister hunted far and wide for a dentist who would repair them - the cuts to NHS dentistry have hit hard, even for children - but she succeeded eventually. In the meantime, she threatened his sister, my niece, with all sorts of dire punishments if she dared to make one comment about this face that was less than sympathetic! Needless to say, no photographs were allowed. Despite his happy attitude towards life, my nephew achieved 13 GCSEs at A-C grade in summer 2011 from his state comprehensive school, making me a very proud aunt. These sheep are grazing at Gors Fawr, the site of a stone circle in the Preseli Hills in West Wales. The circle is just below the bluestone quarry where it is thought that the inner circle at Stonehenge originates from. I was taking photographs there to make a lightbox installation, funded by my Digital Fellowship from the organisation Artsadmin. The sheep remained unimpressed by both the circle and my presence. I developed carpal tunnel syndrome in my right hand after a lengthy period of illness in 2000. (You can read more about my illness here.) Previously I had prided myself on my strong hands - I used a walking stick to improve my mobility, and also did a lot of keyboarding. However, once I was ill and immobile, the ligament around the wrist contracted with lack of use, trapping the main carpal nerve. Despite physiotherapy I was eventually forced to have the surgery, which involves severing the ligament completely to allow more room for the nerve. After four years on the waiting list, this procedure took place after-hours in a GP's surgery, without a sterile environment and with no antibiotic cover: the surgery was so poverty stricken that I had to bring my own dressings with me. Unsurprisingly, I developed a systemic infection which wasn't detected until the following autumn. Ironically, this impaired my ability to participate in the court case to seek compensation for the incident which had caused the illness in the first place. Jester came to me in the autumn of 2002, while I was waiting for the verdict of my discrimination case against the NUJ for the incident that caused me serious illness in 2000. He and his sister Morgan were the only kittens left in the local cats' home, and desperately needed homes. I took them both on the proviso that Morgan would belong to my partner, and would move with her once she was rehoused from her completely inaccessible housing association flat. From the start, the two of them seemed to feel right at home. Jester's paws were never still, playing with toys - and also with my possessions. He has always had a particular fondness for emery boards! Today, he likes to stick his paws through the bannisters when anyone is standing in the hall, and remind people to stroke him. This little cat moved into my studio in very strange circumstances. I had gone to the vet to pick up my Westie, Genie, and admired the kitten in the cage held by the man in front of me in the queue. "I am Fox, and she is yours if you want her," he told me. Actually another cat was the last thing I wanted, but I was looking after two tabby females who were due to move on shortly - Morgan and Doris - and I thought that perhaps my two male cats would miss them. Jinks was the last survivor of a litter of feral kittens which 'Fox' had tried and failed to capture alive, and turned out to be over six months old despite her size. She had been trapped down the side of a freezer in an outhouse she was found, and as well as being thin and scabby had damaged her eye. This is why the image shows her eyes as being two different colours. I had Jinks neutered and microchipped before I took her home, in case she proved to be impossible to contain; however, she has never wanted to leave since. The real problem was that she turned out to be much sicker than anyone had thought, so she lived in my office for six months while she recovered, kept apart from the other cats. At one point it was uncertain if she would survive, but now she is fit and healthy and has thick fur. She will always be unusually small, though. Morgan came to me in the autumn of 2002, while I was waiting for the verdict of my discrimination case against the NUJ for the incident that caused me serious illness in 2000. She and her brother Jester were the only kittens left in the local cat rescue centre, run from the terraced house of a disabled woman, and desperately needed homes. I took them both on the proviso that Morgan would belong to my partner, and would move with her once she was rehoused from her completely inaccessible housing association flat. My partner eventually moved in 2008! Morgan has a head like a rugby player's. When she butts you with it, she can almost knock you over. The notes from her first vet's report as an adult cat read simply: "Wow! Big cat!" Morgan has a condition called 'mega bowel', which means she needs daily injections. These are easier to administer than you might imagine - you just wait until she bends her head to eat, and then hold the roll of fat that appear at the back of her neck; she seldom feels a thing. However, she still needs regular veterinary treatment for the condition and is unlikely to live as long as her brother. Millie originally belonged to my partner's sister, but was fostered by my partner when her nephew started to toddle and Millie began to steal the food out of his hands. She had originally been trained as a gun dog, but had failed all her tests - she hated loud noises, and liked to tear things up rather than carry them gently in her mouth. In particular, she hated car travel. For the first few years, whenever she had to be transported by car, she would stamp her feet, bellow and scatter drool everywhere - it was as if she morphed into a completely different creature. Despite having mammary cancer when she first came to my partner and enduring several operations, Millie lived to the ripe old age of 16.